So proud to find Tom Birdseye's hysterical book on the list! Write on, Tom! As the saying goes, “Most truth is said in jest.” True. But I wasn’t kidding. And I’m not now, either. With both of those books, Vampire Baby especially, what I found happened is that rather than buying and then banning it, parents, grandparents & librarians—yes librarians—school, public and private—ignore it, avoid it, don’t touch it, or read it… Ignore it and it will go away, they think and do. In the case of Vampire Baby, I was told it was because vampires are “taboo subjects” in many schools. At library/educator conventions, including TLA and IRA, I tried to explain to passing browsers how Vampire Baby isn’t really about a vampire. I tried to get the librarian or teacher to see for themselves: “Look at it! Touch it! Read for yourself, you’ll see…” They’d shake their heads or walk on by. As for Not Norman, a Goldfish Story: Now it’s hugely popular & timely! People—adults, children, librarians—take one look at that adorable brown face peeking through the fishbowl with a goldfish for a nose and want to scoop it up. But back in 2005, when Not Norman was published, that was not the case. I’d be at events & book signings, and many browsers, even “friends” who’d bought every other book I’d written offhand, skirted right past. After all, that brown boy didn’t look anything like their children, grandchildren, students… Even still today this may happen. I can’t say for sure because I’ve banned those places. Is being officially “Banned” bad? Yes. No one else should be able to take away our right to choose what we read. READ! READ! READ! All the BANNED BOOKS! 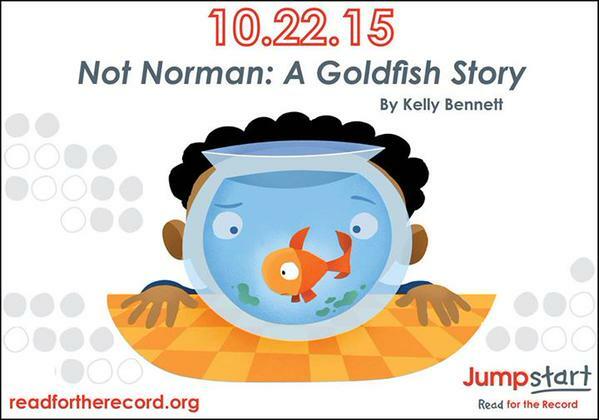 Still flip-flopping over the news that thanks to Jumpstart, on October 22, 2015, Not Norman, A Goldfish Story will star in (with your help--please--help) The World's Largest EVER Shared Reading Event: Read for the Record®, Yes, NORMAN! Of course I jumped at the chance to guest post on the Jumpstart blog. Then I freaked: Oh my! How many kazillion folks read the Jumpstart blog? So, nervous+delighted+honored, I wrote a guest post for the Jumpstart Blog. In it, I shared the story of how I got Norman--the story idea, not the goldfish...or are they one in the same? And, well, chock it up to excitement or nervousness, but, I may have gotten a little carried away. I included some photos and may have shared more than I should have. You decide. As Nanny always said, "Words are one thing you can't take back." Here's the link to the July 8, 2015 Jumpstart Blog Post: NOT NORMAN: THE O-FISH-AL STORY. Sign up to Read for the Record® on October 22, 2015 at readfortherecord.org. Pre-order your special edition of Not Norman, register to read, and download free activity materials and resources at Jumpstart. 10-22-2015 WHO'S READING FOR THE RECORD? NOT NORMAN! You know the song from Guys and Dolls, the one Sister Sarah sings after she loses the bet against Sky Masterson and pays up by going with him to Havana? Cue the music: Ask me how to I feel . . . Well, Sir, all I can say is if I were a gate I'd be swing-ing!/And if I were a watch I'd start/ popping my springs!/Or if I were a bell I'd go ding dong, ding dong ding! Add to that, If I were a fish I’d be flip-ping! Because that’s how I’ve been feeling since I heard the big news—Like that swing-ing gate, that spring-popping watch, that ding-dong-ing bell, that fish! Some of you may know why. For those who don’t, cue the trumpet! My little book, NOT NORMAN, A GOLDFISH STORY, illustrated by Noah Z. Jones (Candlewick Press), is Jumpstart’s Read for the Record book for 2015!!! What’s that mean? Only that, on October 22, 2015 children and adults will read Not Norman together, aloud, it what can become—for the Record—the world’s largest shared reading experience! You, too, I hope. Jumpstart’s Read for the Record, began in 2006, to raise awareness of the achievement gap and Jumpstart's work with preschool children in low-income neighborhoods—and to raise funds to support programs. Candlewick Press, Jumpstart’s partner in the 2015 campaign, in addition to other contributions, will donate some 13,000 copies of the Jumpstart special edition (available in Spanish & English) to ensure that anyone who wants to participate, can! Thrilled as I was when Jumpstart announced Not Norman as the 2015 Read for the Record book, the magnitude of this honor didn’t really register until I did some digging into the history of past campaigns. Since 2006, when more than 150 thousand children & adults read The Little Engine that Could on the same day, thus earning a spot in the Guinness Book of World Records*, funds raised, number of books given to children—for many their first book—and number of children & adult participating has burgeoned. The record high to date is almost 4.3 million, set in 2012, when children & adults reading the same book on the same day! Totally freaks me out to think my little fishy story is on the list with such time-honored classics, all for a single purpose: Helping children read & succeed! For the record: Yes, learning to read the words in a picture book is the goal. But we all know it’s the picture on the cover that compels children to pick up a book, and the illustrations inside that keep them turning—and returning—to those pages. Let’s hear it for Noah Z. Jones! I first met Noah Z. Jones at a school event 6 years after Not Norman was published. Believe it or not, Not Norman is Noah’s first picture book! And, bucking traditional illustration techniques, Noah utilized his animation background and tech-know-how while he was at it; the art for Not Norman by computer! Way back then, 2002-3, computer generated illustrations in picture books were unheard of. In fact, some reviewers scoffed. The rest of us, especially kids & I, loved it! One look at that cover, at that boy’s face peeking through the fishbowl with Norman as his nose, and I just have to laugh-every time! CAUTION: VE VILL BITE UNLESS WE VIN BOOKS FOR JERICHO LIBRARY! GRANDMA MADE ME DO IT . . . I WANT TOOTIE! I NEED TOOTIE! I LOVE TOOTIE! DON'T THINK I VILL NOT BITE FOR BOOKS! BEHIND THIS LIP BROOM I'M 100% BOOK VAMPIRE--SUCKING OUT EVER DROP OF KNOWLEDGE! LOOK INTO MY EYES AND REPEAT AFTER ME: SEND NORWICH VAMPIRE BABY! SEND NORWICH VAMPIRE BABY! BENEATH THESE FANGS WE'RE NICE . WE WON'T BITE . . . UNLESS YOU MESS WITH OUR SHELVES! I Vant Books for Hoover Kindergartners! Each winner will receive a copy of Vampire Baby (from Candlewick Press) and collection of Kelly Bennett Books for the library listed above! Settle your little ones in front of the monitor, click on an Author Read-Aloud video (below), and let them watch and listen while you enjoy some lazy time. Okay, you can view, too--if you promise to act OUR age! VAMPIRE BABY thrilled to be a finalist for the OKLAHOMA BOOK AWARD!! VAMPIRE BABY is sharping her fangs--looking forward to sinking them into Oklahoma Center for the Book folks at the Oklahoma Book Awards on April 12th! What a thrill to be a finalist! Thank you for honoring VAMPIRE BABY, illustrated by Paul Meisel (Candlewick Press). The Year of the Turnip—Glenda Carlile—New Forums Press Inc. The Oklahoma Center for the Book, sponsor of the Oklahoma Book Award competition, is a non-profit, 501-c-3 organization located in the Oklahoma Department of Libraries. Established in 1986 as an outreach program of the Library of Congress, the Oklahoma Center was the fourth such state center formed. It is governed by a volunteer board of directors from across the state. to encourage reading for pleasure by Oklahomans of all ages. For more information about the Oklahoma Center for the Book or the Oklahoma Book Award program, contact Connie Armstrong, 200 N.E. 18th Street, Oklahoma City, Oklahoma, 73105; or call 1-800-522-8116 toll free, statewide; in the Oklahoma City metropolitan area, call 522-3383. When Janni Lee Simner graciously asked me to talk about "Writing for the Long Haul" I'll bet she never expected me to confess how "I Quit!" Read all about it here: ReTired and Better For It! And more about Janni and her dark fantasy BONE OF FAERIES Trilogy and more! She--Suzanne Santillan--the sweet, dulcet-toned author of Grandma's Pear Tree-- twisted my arm, held my fingers to the fire, threatened and cajoled and finally I cracked. . . Truth time: I did not create any of the clever, brilliant, fun, educational Teaching Guides, Activities, Crafts, Puzzles, Story Hours Kits you'll find if you click on the Activities Tab. Behind the curtain, I work with a dynamic talented team who deserve to be acknowledged and shared and receive heaps of thanks and praise for all their efforts. So at Suzanne's urging, I spilled the 4-1-1 on the how, who, and where's of my promotional material on Writing on the Sidewalk. While you're at it, check out Suzanna's book. It won the Golden Moonbeam Award and is dee-lightful!